This time around, Thailand’s elections, slated for February 2019, look like they will actually materialize. But can they rescue its troubled democracy? More than four years after the May 2014 coup, the Thai junta has set a new date for elections: February 2019. Although the military government has frequently postponed elections in the past, it looks likely that the planned ballot will go ahead as all political parties have launched their campaigns, even the pro-junta factions. Will the transitional period bring Thailand on the democratic track? The short answer is “unlikely.” The new military-endorsed constitution has been put in place and several provisions have been designed to weaken democratic institutions. Meanwhile, the military’s power is entrenched. In the future, Thai politics may well resemble that of Myanmar, where the military’s political position is guaranteed by its constitution. 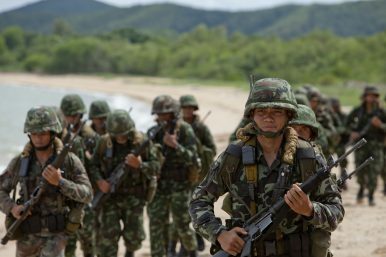 As the Bertelsmann Transformation Index (BTI) report on Thailand for 2018 notes, the new constitution “is meant to weaken political parties and establish military and monarchical control over the executive and legislature.” By including the opportunity for non-elected individuals, for example, members of the military, to be prime ministerial candidates, it ultimately enables ongoing military influence in Thai politics. It is therefore possible that the nation will morph from being under military rule to a military-influenced regime, with a thin democratic façade. It is true that anti-junta political parties are gaining attention from the Thai public. Among them is the Future Forward Party, led by a young billionaire Thanathorn Juangroongruangkit, which offers a pro-democracy platform with promises to deracinate the military’s political influence. Meanwhile, the former ruling party, Pheu Thai, under the helm of the Shinawatra family, is showing its eagerness to compete in the election race, setting up “branches” in the form of smaller parties designed to net maximum votes and to serve, if needed, as “parties in coalition” should the Pheu Thai Party fail to win a majority. But these anti-junta parties face great obstacles. They have been threatened with dissolution by the Election Commission should their campaigns be perceived as breaching the campaign regulations set by the military government. The upcoming elections will reshape the Thai political structure and redefine the old establishment. This will be the first national vote under the reign of King Vajiralongkorn. It could be argued that the coup of 2014 was staged in order that the establishment could be able to manage the royal succession. The end of the Bhumibol era sparked anxiety among the conservative elites about how to maintain the status quo. In this way, the 2019 elections could be seen as facilitating the elites’ tight grip on political power. The conservative leaders’ desperation has started to impede the country’s democratic development, which developed in the wake of the 1997 constitution, dubbed the “people’s charter.” The BTI report, once again, illustrates this decline, with Thailand’s democracy status dipping to 3.3 out of a possible 10 points, putting it in the hardline autocracies category. It will be no surprise if the current premier, also the leader of the coup-makers, General Prayut Chan-o-cha, stays on as prime minister in the post-elections period. After all, the military has proven that it works well with the new monarch, who depended on its support for his throne. Should Prayut continue as Thailand’s prime minister, Thai politics would tilt toward authoritarianism. But even if those who oppose the junta win the elections, they would be deeply hampered by the constitution’s anti-democratic elements. A coup is still an option, as verified by the new army chief, General Apirat Kongsompong, who was handpicked by King Vajiralongkorn to lead the army. Thailand would fall further into a vicious cycle. At present, Thailand’s neighbors remain passive spectators, watching its political saga unfold. Ultimately, the Association of Southeast Asian Nations (ASEAN) sticks firmly to its rule of noninterference. Moreover, the rise of illiberal elements in ASEAN has made most states in Southeast Asia politically vulnerable. But Southeast Asia is hardly alone in demonstrating a rise in illiberalism. The political uncertainties in the United States under President Donald Trump, the military assertiveness of China, the Brexit conundrum in Europe — all point to democracy taking a negative turn. This global pattern has encouraged regimes in Southeast Asia to undermine democratic principles at home. Eyes have been focused on the Rohingya crisis in Myanmar, the growing ruthlessness of the Vietnamese regime against its dissidents, the staying power of Cambodian political leadership, the widening gap between the rich and poor in Singapore, and the mounting totalitarian climate in the Philippines. Such developments have diverted global attention away from Thailand, meaning that many have overlooked the continued harassment of political oppositions by the Thai junta, or the nation’s shrinking of democratic freedoms. In the long run, Southeast Asia will suffer from Thailand’s lack of good governance and its waning democratic values. The resulting political insecurity will likely rattle national and regional economies as the nation’s growing illiberalism dents foreign investor confidence. Pavin Chachavalpongpun is associate professor at Kyoto University’s Center for Southeast Asian Studies. Doubts about the results and the role of the election commission in particular have further intensified distrust about the country’s institutions and muddied the waters.